The buyer is responsible for providing safe and suitable storage and for ensuring that it will take the full quantity ordered. The buyer will also indemnify the seller against claims, damages, expenses or costs which may arise as a result of the buyer not observing these conditions. It is a condition of sale of any Aviation or Motor Fuels supplied against ticketed invoices that the Buyers will strictly observe all the conditions of their Petroleum storage licence and that they will not allow any smoking or naked lights nor permit any stoves, electric or gas fires or radiators to function in proximity to a tank or inlet pipe into which a delivery of spirit is being made or a vent pipe connected to such a tank and will indemnify the Sellers against any damages, claims or costs arising out of a breach of this clause. The product supplied against ticketed invoice will be charged at the prices ruling on the day of delivery irrespective of the date of order. Sellers measurement of quantity will be accepted by Buyers. All packages contain full measure when delivered by Sellers but owing to the volatile nature of Petroleum they cannot hold themselves responsible for any shortage after the packages leave their hands. Acceptance by Buyers of products supplied against ticket invoice will be treated as an acceptance by them of these conditions. The Consumer shall be responsible for the dipping of his tanks and shall confirm to the driver that there is room for the load. An additional charge to cover Government VAT payable by the Seller in respect of monies received from the sale of goods liable to such tax, is shown separately on the Sellers invoice applicable and forms part of the Sellers price of the goods. Where oil is sold to a private residence and invoiced to a third party, it is agreed that whomsoever shall sign the receipt acknowledging delivery shall in addition to the party being involved be liable to the seller both as principal and as agent of the buyer and shall discharge the amount due in the event of the buyer failing to do so within thirty days from the receipt of the goods at the residence. Risk or loss of damage to the products sold to the Buyer shall pass to the Buyer at the time of delivery but property in such products will not pass to the Buyer, AND TITLE SHALL REMAIN VESTED IN THE Seller or his agent until payment in full of the invoice price thereof and all sums due and owing from the Buyer to the Seller or his agent on any account whatsoever, until such time the Seller or his agent shall be entitled to re-delivery of the products and for the purpose of inspecting or recovering the same, to enter upon any premises where any such products are stored or thought to be stored. If the Buyer shall at any time mix such products with similar products of its own, it shall be deemed to dispose of its own products before disposing of any of the Sellers or his agents. When an order paid by debit or credit card is placed on this website the full value of the order placed is deducted from the debit or credit card at the time of ordering. In the event that the delivered amount is less than the amount ordered we will refund the difference back to the debit or credit card used to place the order. The unit price charged may vary where the delivered quantity is less than the ordered quantity. Delivery will normally take place within one to two working days of receiving an order but during busy times and in poor weather conditions it may take longer. 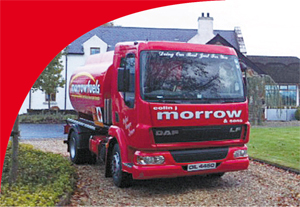 Morrow Fuels will make every effort to make a prompt delivery but cannot accept responsibility for delays caused by circumstances beyond our control. If for any reason we are unable to fulfil a delivery for an order which has been placed and paid for through this website we will refund in full the value of the order placed. The refund will be processed back to the debit or credit card used to place the order. We reserve the right not to accept an order placed and paid for on this website. Refunds from this website are processed through our payments processor and the banking system and can take between three and ten days to complete. Morrow Fuels is committed to protecting personal data. This privacy statement describes how and why we collect and use personal data and provides information about individuals rights. It applies to personal data provided to us, both through direct interaction with individuals and by online means such as websites or emails. We may use personal data provided to us for any of the purposes described in this privacy statement or as otherwise stated at the point of collection. Personal data is any information relating to an identified or identifiable living person. Morrow Fuels processes personal data for numerous purposes and the means of collection, lawful basis of processing, use, disclosure, and retention periods for each purpose may differ. 4. Law enforcement or other government and regulatory agencies or to other third parties as required by, and accordance with, applicable law or regulation. We will only retain your personal data for as long as necessary to fulfil the purposes we collected it for, including the purposes of satisfying any legal, accounting, or reporting requirements. HMRC recommends six years. We take the security of all data we hold seriously. We have in place policies and procedures which cover data protection, confidentiality and security. We regularly review the appropriateness of the measures we have in place to keep the data we hold secure. Some Pages of our website may permit you to send emails or other messages to us. Emails and messages sent to us will contain your name and email address, as well as any other information you may wish to include in the message.